The Pope and Ecumenical Patriarch Bartholomew issued a joint plea urging Muslim leaders to condemn terrorism carried out in the name of Islam. Pope Francis on this three-day visit to Turkey. Winding up a historic three-day visit to Turkey, Francis also urged Muslim leaders worldwide to “clearly” condemn terrorism carried ou in the name of Islam. He said he had told Turkish President Recep Tayyip Erdogan that “it would be wonderful if all the Muslim leaders of the world — political, religious and academic, spoke up clearly and condemned” violence which damages Islam. “That would help the majority of Muslims if that came from the mouths of these political, religious and academic leaders. We all have need of a global condemnation,” Francis told reporters aboard the plane taking him back to Rome. 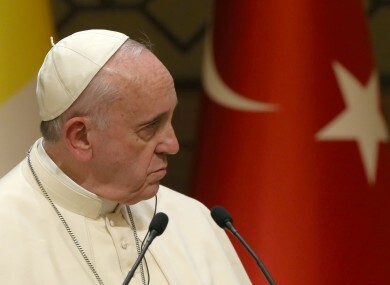 On the final day of his first visit to Turkey, Francis also urged an end to the millennium-old schism between the Orthodox and Catholic Churches and said this was all the more urgent due to the violence against Christians by Islamic State (IS) extremists. The pope’s trip to Istanbul — once the capital of the Christian Byzantine world and formerly known as Constantinople — was marked by his overtures to Muslims and other Christian confessions. The pope early Sunday attended a divine liturgy led by Orthodox Ecumenical Patriarch Bartholomew I, the “first among equals” of an estimated 300 million Orthodox believers. In a joint statement, Bartholomew and the leader of the world’s Roman Catholics said they could not let Christianity be driven out of the region. “We cannot resign ourselves to a Middle East without Christians, who have professed the name of Jesus there for two thousand years,” the Church leaders said. The two Church leaders also called on the parties involved in the Ukraine conflict “to pursue the path of dialogue and of respect for international law”. Pope Francis in an address at the Orthodox Patriarchate on the banks of the Golden Horn urged an end to the schism between Orthodox and Catholic Churches. “How can we credibly proclaim the message of peace which comes from Christ if there continues to be rivalry and disagreement between us?” he said. Bartholomew for his part said that while the road to full communion would be “perhaps lengthy and sometimes even rugged” it was irreversible. The pope and Bartholomew have in the last months worked hard for a rapprochement between the eastern and western Churches which have been split since the schism of 1054. The reconciliation began in 1964 with the famous embrace in Jerusalem between Pope Paul VI and Ecumenical Patriarch Athenagoras, the first such meeting since the 15th century. Bartholomew, who commands considerable respect beyond the Orthodox Church, holds an office that dates back to the early days of the Byzantine Empire, over a millennium before the Ottoman conquest of Constantinople in 1453. The patriarchate in Istanbul remains his headquarters and the patriarch himself must under Turkish law be a citizen of the country. During a prayer service Saturday, the pope bowed his head and asked Bartholomew to kiss him on his brow, in a remarkable sign of humility towards the patriarch. In another hugely symbolic moment, the pope during a visit Saturday to Istanbul’s Ottoman Sultan Ahmet mosque — better known abroad as the Blue Mosque — turned towards Mecca and stood in two minutes of reflection next to a top Islamic cleric. “I prayed for peace, for Turkey, for everyone, for myself. It was a moment of sincere prayer,” the pontiff later said about the gesture. His trip was marked by crowds far thinner than during previous visits abroad but also by the heaviest security, which extended to positioning snipers on the balconies of mosque minarets. Turkey’s own Christian community is tiny — just 80,000 in a country of some 75 million Muslims — and only a small proportion of these are Catholics. The pope, making only the fourth papal visit to Turkey, at times looked fatigued during the crammed three-day programme but was often seen breaking into a smile at the sight of an old acquaintance. His trip was less controversial than the last by a pontiff to mainly Muslim Turkey — the visit by Francis’s predecessor Benedict XVI in 2006 was overshadowed by remarks he had previously made deemed to be anti-Islamic. Vatican spokesman Federico Lombardi described the atmosphere this time as more “cordial and serene”. Email “Pope: We can't allow a Middle East without Christians”. Feedback on “Pope: We can't allow a Middle East without Christians”.